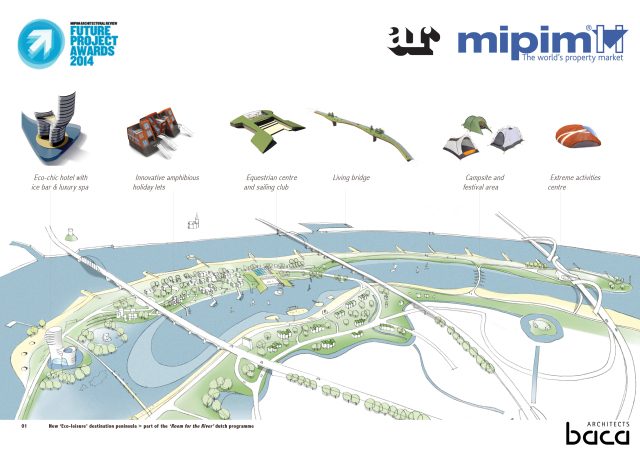 OToday we can proudly announce that Baca Architects has received MIPIM’s Regeneration and Masterplanning Award for the Eiland Veur Lent project in Nijmegen, currently under construction. The awards will be presented during the annual MIPIM event at Cannes in March. The Making Space for Water programme marks a paradigm shift in flood mitigation, with developments designed to make space for floodwater, working in harmony with natural processes, rather than building dykes and levees that limit flood storage and can be overtopped. Construction began in 2013 on a major flood relief channel between Nijmegen and Lent in the Netherlands. The holistic project includes a major dyke relocation and new flood-relief channel as part of the national ‘Room for the River’ programme to reduce flood-risk and support urban growth in Lent. Baca were invited to draw-up plans for the newly created ‘island’. Baca’s ’Retreat’ proposal combines water recreation, river ecology, flood-resilient development and sustainable infrastructure to create a self-sufficient ‘eco-leisure’ destination. It will be an exemplar, integrated solution and showcase for international architectural and technical innovation. Including a 70m tall landmark tower, series of 100 luxury flood-resilient resilient homes and holiday lets cascading down to touch the water and link with a floating quay, plus a parkland for recreation, nature and seasonal flooding, the project will unite on many levels, fusing past with future, harmonising nature with development and re-connecting residents with the water.